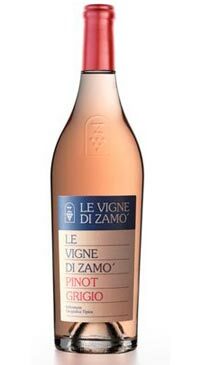 Le Vigne di Zamo dates back to 1924 and has been growing grapes and making wine in Friuli since that time. The dedicated team at the winery crafts an array of world class white and red wines from indigenous grapes as well as international varietals. The grapes were picked at full ripeness and then destemmed. Half of the fruit was cold-macerated before fermentation at controlled temperatures in stainless steel. The other half was left on the skins for four days, completing fermentation in five-hectolitre oak barrels after pressing. Throughout maturation, the two lots of wine were kept separate. Low intervention winemaking; the only operations carried out were monitoring of malolactic fermentation in the wood-fermented wine, and weekly lees stirring on both batches. After about six months, the batches were blended and the wine went into bottle. This Pinot Grigio is pinkish, onionskin in colour. The nose reveals fruit and flower aromatics mingling with maturation-derived notes of yeast and crusty bread. Vanilla and a faint hint of smoky toastiness round off the intense bouquet. The mouth filling, glycerine-rich palate has warmth and breadth, signing off with very savoury acidity and a hint of tannins.